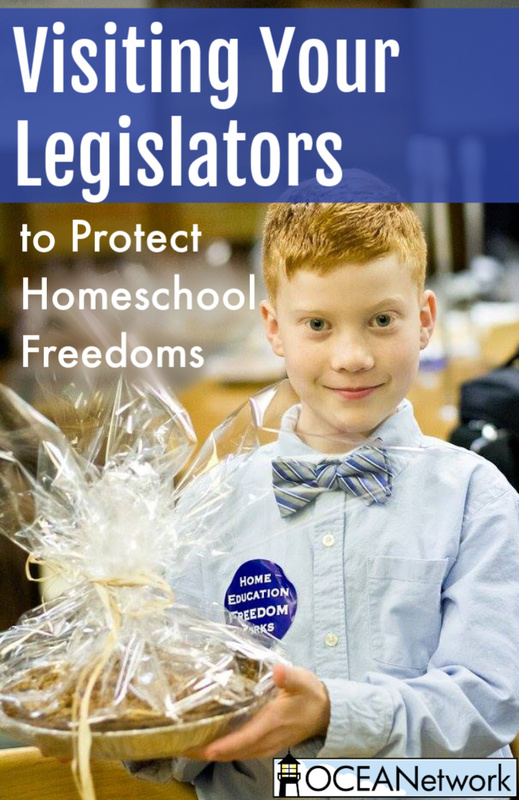 Visiting your legislators can be an incredibly effective way to help promote and protect homeschool freedoms. It is a wonderful way to connect legislators with the “face” of real homeschooling, while helping to educate them on how homeschool freedom works. If you have never done this before it can be intimidating, but with a few tips and a plan, it should be lots of fun for you and your children. It’s definitely a great field trip opportunity for your family or a group of homeschool families! 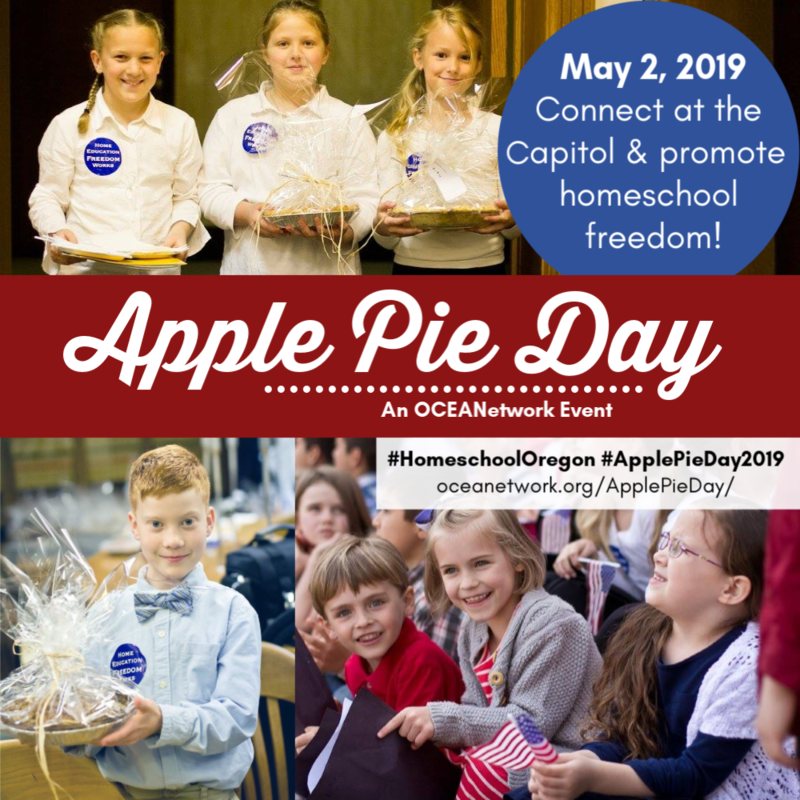 Join Other Oregon Families & Visit Your Legislators on Apple Pie Day – May 2, 2019! Join OCEANetwork for Apple Pie Day on May 2, 2019! This event is hosted by OCEANetwork every other year and is an easy, fun, and educational way to visit your legislators! Come together with homeschool families from across Oregon to connect with each other and help educate legislators and the general public on how wonderfully homeschool freedom works. During Apple Pie Day, you will get a chance to help deliver apple pies to the legislators (they love it!) and talk with them about homeschool freedom. Visiting Your Legislators on Apple Pie Day Is as Easy as 1-2-3! Email the Apple Pie Day committee to let us know the name of the legislator you’re visiting, the appointment time, and whether you are bringing a pie. 2. Ask for a short appointment – 10 to 15 minutes – to visit and share a little about what’s important to your family. 3. Arrive on time at the legislator’s office. Homeschooling is the fastest growing method of education in the United States. Homeschooling is one-on-one tutoring that helps students thrive. Homeschooling tailors the education of the student to the specific interests and learning styles of the child and family. Homeschoolers score, on the average, 20-30% higher than public school students. 5. Give him or her a few examples of why you like homeschooling, how your children have benefited, or some cool things your children have been able to do because they are home educating. 6. They’ll probably want to ask your children questions like “What is your favorite subject?” “What grade are you in?” (If your children are many homeschoolers, they really don’t know what grade they are in – 4th in spelling, 6th in math, and everyone from the baby on up is studying ancient Egypt.) Spend some time rehearsing with your students before you arrive so they are comfortable with the conversation. 7. Bring your camera. Get a picture taken of your family with your legislator. Tell him or her that you will use the picture to remind you to pray for them – and do it! 8. Leave on time. You’ll be surprised how quickly 10 minutes goes. Thank him or her for seeing you. 9. Send your legislators thank you letters. Those written by the children will receive special attention. Include a copy of the picture, if you took one. 10. You are building a relationship with the person representing you and letting your legislators know that “Home Education Freedom Works!” If you have occasion to write your legislators in the future, you can remind them of your visit, thank them again for taking time to see you and tell them your position on a piece of legislation. Your visit to your legislators can be an exciting event for your family and very memorable for your children and it will go a long way toward protecting your freedom to homeschool. Get ready for some wonderful family fun, too! There are other opportunities to serve, tours to sign up for, a noontime rally featuring Jay and Heidi St. John as speakers, a homeschool choir, and more!